Is it me or do the Christmas decorations and promotions seem to come out earlier and earlier each year? This year, I just so happened to be doing a bit of shopping at Target before Halloween. I remember the date--October 22nd--because I was in Iowa City for Iowa Homecoming. My friends and I were mostly just browsing the aisles and happened upon the creepy Halloween decorations. And that's when I spotted, in the very next aisle, the dreaded Christmas decorations. Christmas is still 2+ months away!! It seems that it has already taken over Thanksgiving and is now gunning for Halloween as well. What the heck? Please stay confined to your own month of December. Is that month really not enough? Christmas decorations are coming out earlier, advertisements are pressuring shoppers to get an even earlier head-start on their gift shopping, lights are being strung, and Thanksgiving is being all but forgotten. That is why this year I am taking the pledge--the pledge to Respect the Bird. Respecting the bird is about celebrating and restoring Thanksgiving to it's rightful place, not merely brushing over it as "a one-day delicious afterthought between Halloween and Christmas." 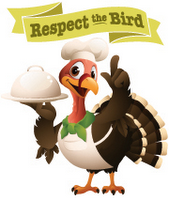 Respect the Bird has a lot of ways for you to join the movement--on Twitter, on Facebook, and on it's website. Thanksgiving is my favorite holiday. It's not about shopping or buying gifts for others, but it's about thankfulness. It's for spending time with friends and family and being grateful for all the good things God has given us. It's for celebrating the harvest and enjoying the great bounty we can gather from the earth. You should not be surprised, due to my Thankful Thursday posts, that I very much enjoy reflecting on all that I have to be thankful for. It puts so much into perspective for me. This year I am taking the pledge to Respect the Bird. Okay so I kinda just threw that last one in there, but you get the point. While it is Thanksgiving I will only worry about Thanksgiving. That being said, I will probably look through all the Black Friday ads on Thanksgiving night when I get home. I have a weird love for looking through ads and browsing, but I admit I have never, nor never really had the desire to, gone shopping at some ridiculously early time in the morning on Black Friday. Although, my mom and I have done a little shopping on that Friday, we usually don't start shopping till around noon because we figure all the crazy people who've shopped for 6+ hours have to have gone home already. I will say, I am a little disappointed in the stores that feel the need to open at midnight. Ahem, Target, ahem. Think of the thousands of employees that will need to cut their Thanksgiving celebrations short to go to work or go to sleep so they can go to work. All for some people to go shopping. Seems a little ridiculous doesn't it? I will not be participating in this midnight shopping, rather I will be cuddled up in my bed. So Respect the Bird! And click here to pledge.